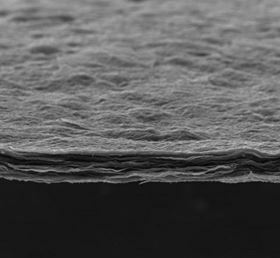 The new graphene-based catalyst is just 15µm thick. Image: Tour Group/Rice University. Graphene doped with nitrogen and augmented with cobalt atoms can make an effective and durable catalyst, according to scientists at Rice University. Together with colleagues at the Chinese Academy of Sciences, the University of Texas at San Antonio and the University of Houston, the Rice lab of chemist James Tour has reported the development of a robust, solid-state catalyst for producing hydrogen from water. Expensive platinum-based catalysts are known to be able to split water into its constituent hydrogen and oxygen atoms, providing a potential route for producing the hydrogen required to power certain fuel cells. This latest discovery, detailed in Nature Communications, is a significant step toward lower-cost catalysts for hydrogen production, according to the researchers. "What's unique about this paper is that we show not the use of metal particles, not the use of metal nanoparticles, but the use of atoms," Tour said. "The particles doing this chemistry are as small as you can possibly get." Even particles on the nanoscale work only at the surface, he said. "There are so many atoms inside the nanoparticle that never do anything. But in our process the atoms driving catalysis have no metal atoms next to them. We're getting away with very little cobalt to make a catalyst that nearly matches the best platinum catalysts." In comparison tests, the new material nearly matched platinum's ability to begin reacting at a low onset voltage, which is the amount of electricity needed to begin separating water into hydrogen and oxygen. The new catalyst is mixed as a solution and can be reduced to a paper-like material or used as a surface coating. Tour said that single-atom catalysts have been realized in liquids, but rarely on a surface. "This way we can build electrodes out of it," he said. "It should be easy to integrate into devices." The researchers discovered that heat-treating graphene oxide and small amounts of cobalt salts in a gaseous environment forced individual cobalt atoms to bind to the material. Electron microscope images showed that the cobalt atoms were widely dispersed throughout the samples. They tested nitrogen-doped graphene on its own and found it lacked the ability to kick the catalytic process into gear. But adding cobalt in very small amounts significantly increased its ability to split acidic or basic water. "This is an extremely high-performance material," Tour said. He did note, however, that platinum-carbon catalysts still boast the lowest onset voltage: "No question, they're the best. But this is very close to it and much easier to produce and hundreds of times less expensive." According to Tour, atom-thick graphene makes an ideal substrate, because of its high surface area, stability in harsh operating conditions and high conductivity. Samples of the new catalyst showed a negligible decrease in activity after 10 hours of accelerated degradation studies in the lab. Scientists have discovered that nitrogen-doped graphene can greatly enhance the sensitivity of Raman spectroscopy. Nitrogen-doped graphene quantum dots can convert carbon dioxide into complex hydrocarbons like ethylene and ethanol. Scientists have discovered that previously undetected manganese atoms contaminating graphene are responsible for its catalytic abilities.